Departing from the Bon Accord Lagoon at 9 am we cruise along the beautiful Caribbean coast to Plymouth while fishing for lunch along the way. From Plymouth we head 1 mile offshore to the 40 fathom drop where we are on the look out for marine life. Dolphins, Turtles, Manta Rays and other large marine creatures. We then return to the famous No Mans Land beach for a warm Caribbean swim while the crew prepares an amazing lunch and captain "Frothy's" famous Rum Punch and beach party. US $125.00. pp. All inclusive. This Nature lover's cruise takes you to the Caribbean or Atlantic coast in search of marine life. 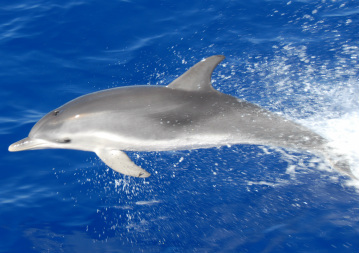 Dolphins, Leather Back Turtles, Hawk's Bill Turtles, Green Turtles, Manta Rays, Eagle Rays and Sting Rays can be spotted and on occasion even Whales and Whale Sharks have been seen. As fishermen we spends lots of time on the sea, this gives us a good idea of where to seek out Tobago's amazing marine life. Departing at 9 am and returning at 1 pm. Transfers and light refreshments included. US $80.00. pp. This all day tour starts with a 4 hour fishing trip followed by a visit to a stunning Caribbean beach where the crew will cook your catch and serve with some delicious sides. Have a swim and relax aboard our comfortable 43 Bertram convertible boat Starting from the Bon Accord Lagoon at 9 am and return 5 pm. refreshments included. Departing from the Bon Accord Lagoon at 4.30 we take a short cruise along the Mangrove Lagoon, through the Bucco Reef, then on to Store bay where we anchor up in time for an amazing Caribbean sunset. Our crew will serve hors d'oeuvres , rum punch , beer and wine during this 2 hour tour.